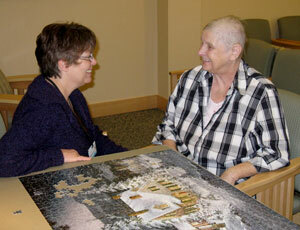 Theresa Lever, a patient navigator in Berlin, VT, chats with cancer patient Linda Pierce. As the only patient navigator in the cancer program at Central Vermont Medical Center in Berlin, Theresa Lever says what she enjoys most about her job is there that is “no such thing as a typical day.” She works one-on-one with patients to minimize barriers that may impede their cancer treatment. How she accomplishes that varies widely. Just as Lever doesn’t have a typical day, there doesn’t appear to be a “typical” patient navigator (PN). Job descriptions, educational requirements and program models vary widely across the nation. Patient navigators’ educational backgrounds range from community residents trained for specific navigation purposes to registered nurses and other professionals with advanced degrees. 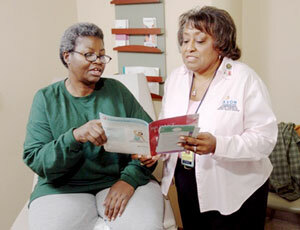 The rapidly growing Cancer Patient Navigators of Georgia (CPNG) provides services throughout the entire continuum of cancer care, from prevention and screening activities to end of life care. In Kentucky, a PN program focuses solely on getting Appalachian women with abnormal Pap smears to access follow up care. In Texas, patient navigators known as promotores help patients better control their chronic diseases. Dr. Harold P. Freeman is credited with pioneering the patient navigation concept in 1990 for the purpose of eliminating barriers to timely cancer screening, diagnosis, treatment, and supportive care for poor and underinsured populations. Dr. Freeman’s work gained national recognition, ultimately resulting in the passage of the Patient Navigator Act of 2005. Patient navigation has proven so effective in cancer care models that the American College of Surgeons’ Commission on Cancer 2012 Cancer Program Standards (Standard 3.1) require cancer programs to phase in patient navigation services by 2015. Common barriers patient navigation addresses include language and cultural differences, lack of transportation, financial pressures such as lack of insurance or inability to pay deductibles, and psychosocial issues. 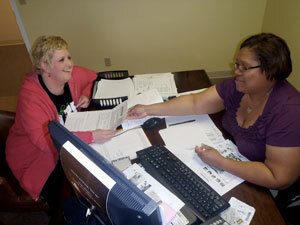 Angela James (r), a social worker navigator in Rome, Ga., is one of currently 254 patient navigators in 30 counties in the state. CPNG, with services in nearly 30 counties and 254 patient navigators to date, is the first and only state to bring cancer patient navigators of all levels and working in various programs together within one organization, according to Angie Patterson, Director of Patient Navigation and Survivorship for the Georgia Cancer Coalition. Because their research has shown that rural people living farther away from major medical centers are less likely to participate in screenings or treatment models such as clinical trials, CPNG affiliated programs work closely in rural areas with local faith-based organizations and centers of social interaction such as schools. Beard added that Emory University’s Rollins School of Public Health assists with development of methodology for best outcomes and quality data to establish outcomes. Rollins has also developed a Train the Trainer patient navigation module that is being provided free to Georgia hospitals. Patient navigation is an important component in the success of the Georgia Comprehensive Cancer Control Plan overseen by the Georgia Department of Public Health, Beard said. CPNG organized in 2008 under the umbrella of the Georgia Cancer Coalition, an initiative of the Georgia Research Alliance. CPNG is supported by GASCO and various sources of private and public funding. In Kentucky, county public health departments provide cervical cancer screening services (Pap tests) for women living in rural Appalachian areas of the state. Yet a high number of women identified as having abnormal Pap tests did not pursue the recommended follow-up care. With a grant from the National Cancer Institute, the University of Kentucky Injury Prevention and Research Center began a patient navigator program to improve adherence for recommended follow-up treatment. A lay navigator with the Avon Foundation Community Education and Outreach Initiative, Ms. Dorothy McMichael (r), offers information and support to cancer patients. Cervical cancer statistics from 2010 showed that cervical cancer incidence and mortality rates were higher in Appalachian regions than in other areas of the United States. Of six central Appalachian states, Kentucky had the highest cervical cancer mortality rates. Initial research revealed these women were less likely than their non-Appalachian counterparts to seek follow-up care. Reasons included a lack of personal and public transportation, long distances to providers, scheduling conflicts with childcare and work, financial problems, and cultural and trust issues related to medical care. To address these issues, six women who were lifelong residents of Appalachian Kentucky were recruited and trained to be patient navigators. Public health nurse case managers referred patients to the patient navigators, who met with the women, assessed barriers for follow-up care and helped schedule appointments. PNs also did appointment reminders and performed logistical tasks, such as helping with paperwork and arranging transportation. Dignan said they anticipated reaching 450 women and were pleased that 519 women 18 and older participated. Project analysis is underway now and final results should be available soon. The University of Kentucky Markey Cancer Center also offers an American Cancer Society Patient Navigator Program to improve the quality of life for cancer patients, survivors and their caregivers. Esperat, who is associate dean for Clinical Services Engagement in the Texas Tech University (TTU) School of Nursing, is also the Transformacion Para Salud project director. TTU is administrator for the Larry Combest Community Health and Wellness Center, a nurse-managed Federally Qualified Health Center serving Lubbock County and surrounding rural areas. Center patients with poorly managed diabetes, hypertension, congestive heart failure, chronic obstructive pulmonary disorder (COPD) and asthma are referred to the promotores, who visit patients at home over a two-year period, addressing the patient’s progress at each visit. The promotores begin by building a relationship with the patient to gain trust and encourage patient compliance. Promotores provide education about the particular disease and its process and help the patient set goals and make lifestyle changes to improve the patient’s medical condition. For instance, with patients who are diabetic, promotores help the patient set goals such as monitoring glucose, exercising daily and making good nutritional choices. The promotores then works with the patient on an ongoing basis to minimize choices that might impede the patient’s adherence to these lifestyle changes. Promotores also assist patients with a variety of other health-related issues, such as transportation needs, support resources and health-related paperwork. Patient Navigator Program Project Coordinator Debra Flores said patients cannot be mandated to participate so promotores need good personal skills as well as ongoing training related to chronic disease support. Funding from a HRSA grant supports the project, which includes hiring and training the promotores. Four promotores each completed 160 hours in state requirements to attain certification as community health workers and then completed an intermediate training curriculum developed by nurse practitioners at the Larry Combest Center. They continue ongoing training under Flores’ direct supervision. In the first two years, 200 patients received navigation services. There are 139 patients enrolled in the current cohort. Data is being collected to assess overall results. In Berlin, Vermont, Lever said the need for patient navigation services became apparent in 2009 with the long-awaited opening of a radiation oncology center to accompany existing CMAP cancer services. Berlin, a town of 3,000, serves a region of 66,000 potential patients. She contacts individuals to schedule mammograms or screenings, works with patients to bill insurance or find other means of financial assistance, coordinates transportation for appointments, and may even arrange temporary housing. At one point, she said, four patients diagnosed with mental illness were simultaneously receiving cancer treatment. All four were also homeless. One of Lever’s most rewarding patient interactions was helping a patient with prostate cancer keep his home. He was unable to work full time because his wife was permanently disabled and he cared for her, and he had been unable to pay their property taxes the last three years. Lever researched Vermont’s tax laws and helped the patient receive an abatement. Then she accessed funding resources to help the couple pay the taxes that weren’t abated. This entry was posted in Around the Country and tagged Access, Appalachia, Cancer, Community health workers, Georgia, Health conditions, Health screening, Healthcare workforce, Kentucky, Population health, Public health, Texas, Vermont, Wellness/ health promotion/ disease prevention on May 17, 2012 by Rural Health Information Hub.